My goodness, I feel like it was just yesterday that I shared an update on the One Room Challenge and yet here we are already in Week 4! I'd be lying if I said I wasn't getting slightly anxious at this point. If you're new here you can catch up on all of the ORC details and room progress here, here, and here. 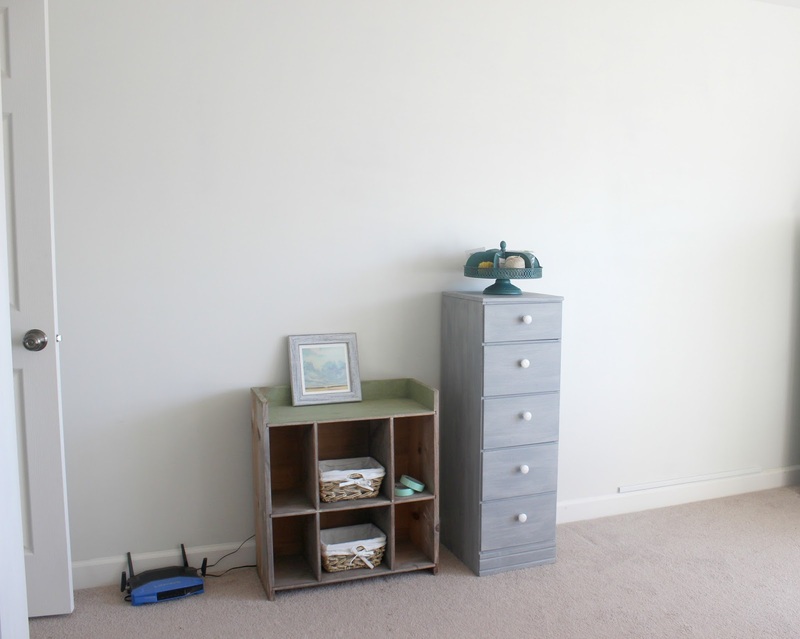 In summary, I'm transforming an extra bedroom into a home office and craft space. So the past week consisted mostly of me still decrapifying and organizing all of my craft supplies. The good news is I'm starting to see the light at the end of the tunnel in regards to the clutter, the bad news is I feel like I added about twenty more tasks to my to-do lists this week. Today I thought it would be great to share a brief summary of the major things I'll be working on over the course of the next week or two. 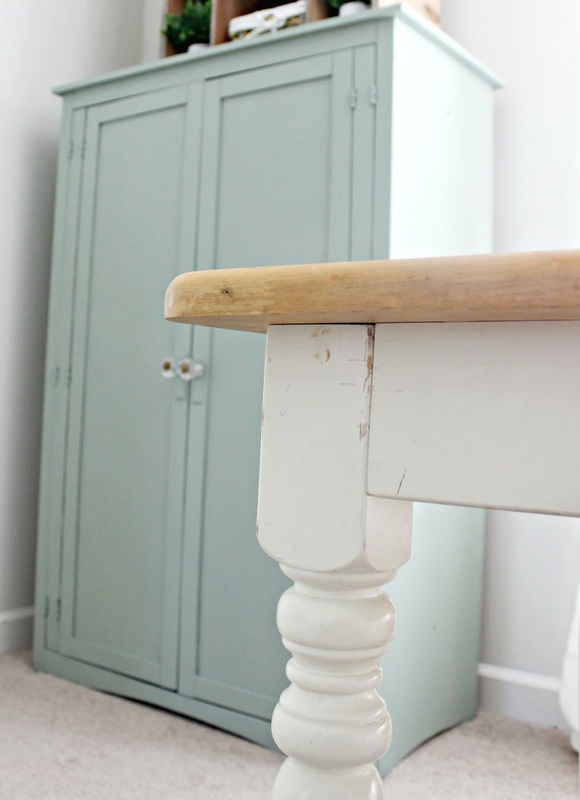 Remember the farmhouse-like table/desk I used in my inspiration board for this room? Fortunately, I had almost the exact same table sitting in our basement collecting dust. The tabletop has seen better days though, so it needs to be stripped, sanded, and refinished. The legs could use a fresh coat of paint as well. This is what the hutch (pictured above) looks like in the inside right now. I need a space to store both my printer and Silhouette machine, so we need to build and add an extra shelf. We also need to drill some holes through the back of the hutch to stream the printer and Silhouette wires through to the outlet behind it. It's no secret that the large blank wall that houses our router has been a pain in my arse. The good news is the hubby took a look at it and we can relocate the router outlet closer to the center of the wall. That way any furniture I use to disguise it won't have to be oddly placed right by the room's door. Speaking of furniture, after tirelessly looking for a small side table to place next to the five drawer dresser (to store the router on) I decided we should just take the DIY route and build one. Yep, I like to make things more difficult apparently! 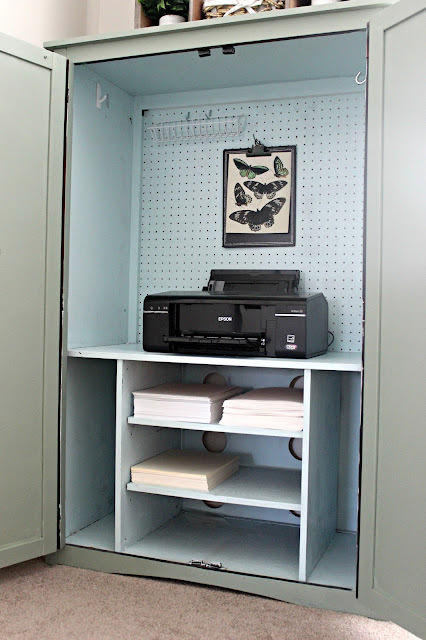 So aside from organizing all of my craft supplies I want to really "beautify" the craft closet. I haven't really decided on how I'm going to do that yet. I considered wallpapering it with some pretty removable paper but I think I may try to find a less expensive way to dress it up. Paint it? Add a colorful pegboard? More shelving? So that's a brief rundown on some of the bigger projects I have left to do, not to mention accessorizing. I plan on using a lot of items I have on hand but I really need to make some final decisions on a few new decor pieces ASAP. Most of them are online and I'm getting pressed for time when it comes to shipping! Boy, do I need to get my bootie moving this upcoming week. Don't forget to swing by the Calling it Home Blog to check in on the rest of the participants. You can do it! I can't wait to see! Love that you have a closed space to store your printer, very smart. Maybe someday they'll create printers that actually look beautiful sitting out? A girl can hope, right?